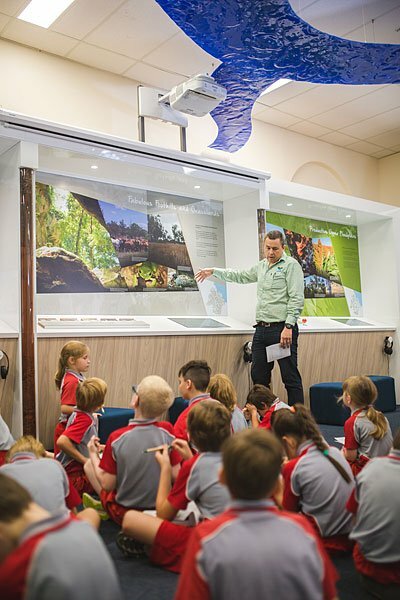 Flow education excursions are an interactive and exciting way for school groups to learn about their region. Facilitated by expert FBA staff members, students will be immersed in an engaging educational experience for one and a half hours in the newly renovated Flow Centre. The centre is bursting with new features and state-of-the-art technology. Interactive screens are loaded with hundreds of stories and fun facts, virtual reality headsets are waiting to transport visitors, and old-fashioned science experiments are ready to amaze. Excursions cater up to 25 students of any age and are tied to the Australian School Curriculum. There are now nine different excursion topics to choose from see below for more information. Special spaces Explore the unique landscapes and protected areas of the Fitzroy region to learn about biomes, ecosystems and food webs. Beasts of the basin Examine local iconic plants and animals to learn about species distribution, habitat, adaptation, threats and how we protect them. Productive pastures Discover where your food comes from to learn how food and fibre is produced and how farmers care for the environment while boosting productivity. Beneath our feet Investigate the rich resources that feature in our region to learn about the rock cycle, geology, soil formation, types and testing, and how we protect our soils. A place to call home Consider what makes Central Queensland a great place to live and learn about the region’s demographics and how humans’ impact on the environment. Rich reefs Delve into the Great Barrier Reef and discover its beauty and resilience to learn about how our actions on land and water can impact this incredible environment. Caring for catchments Look at our whole catchment and how water is crucial to our lives to learn about the water cycle, catchment processes and how we improve water quality. Weather and climate Watch our wild weather and climate to learn about weather patterns, climate change and how this will impact us in the future. Traditional ecological knowledge Listen to our region’s Traditional Custodians to learn an Indigenous perspective about living off the land and caring for country.